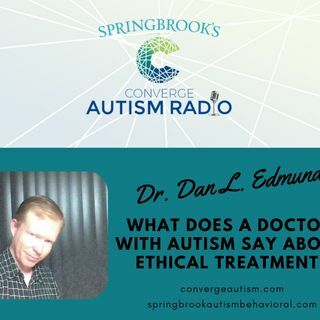 What Does a Doctor with Autism Say About Ethical Treatment? What does a doctor with Autism have to say about working with patients who also have Autism? Join Dr. Dan Edmunds and our host Kristin Walker as they discuss ethical treatment and his unique understanding of ASD. Dr. Dan L. Edmunds is an Internationally Certified Advanced Alcohol and Drug Counselor, Psychotherapist, and Psychological Evaluator (working under supervision). Dr. Edmunds completed undergraduate studies at the University of Florida and received a Master of Arts in Theology from the ... See More University of Scranton, a Jesuit institution. Dr. Edmunds completed post graduate coursework in Dispute Resolution at Nova Southeastern University. Dr. Edmunds earned a Doctorate of Education in Pastoral Community Counseling from Argosy University of Sarasota. He is a Diplomate of the American Psychotherapy Association and a member of the American Psychological Association. Dr. Edmunds work has focused on autistic empowerment, relational approaches to extreme states of mind and addiction recovery. His work has been featured at Psychology Today online, Autism File, Autism Radio, CCHR International, Autism Parenting Magazine, Recovery Radio (Rhode Island), Mental Health News Radio Network, Talk Recovery (Vancouver, BC, Canada), Autism World, Chronogram Magazine, Psychology Tomorrow, InRecovery Magazine, Pioneer Magazine, CNN Philadelphia and radio programs in Des Moines, Iowa; Hartford, CT; Providence, RI; Phoenix, AZ; Los Angeles, CA; Daytona Beach, FL; Tampa, FL; Melbourne, FL; Oakland University; and Providence, RI.